Situated in a dramatic coastal setting near Scots Bay, Kings County, the 428 hectare Cape Split provincial park reserve is the most ecologically-intact portion of the North Mountain and one of the most important undisturbed areas on the Bay of Fundy. The property includes several rare or threatened plant species, old forest, prehistoric sites, rare and semi-precious minerals and one of the most prominent coastal hiking trails in Nova Scotia. 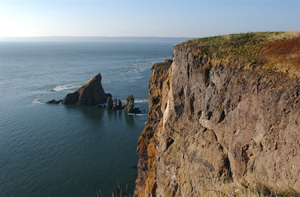 To ensure the intrinsic values of Cape Split provincial park reserve are protected for the benefit of present and future generations, the Nova Scotia Department of Natural Resources has prepared a preliminary management plan that defines a vision and philosophy that will guide future management decisions affecting the park. Comments would be appreciated on or before June 30, 2009.